CD review: "Chamber Music for the Inner Ear"
This review first appeared in the June 24, 2002 edition of the American Reporter. 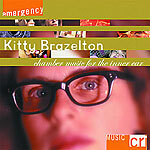 Kitty Brazelton, she of the off-center rock and jazz projects, is now tackling classical music. No surprise in that "Chamber Music for the Inner Ear" is as delightfully odd as its title  and as Brazelton's earlier recordings. Like jazz composer Carla Bley, Brazelton has the rare ability to lay down brash, bold melodic themes atop atonal, dissonant backing passages in such a way that it seems completely natural and organic. Think of Yoko Ono's experimental nature coupled to vision and taste. And Brazelton is thematically less constrained than almost any other composer. The works on her new release range from near-caustic to almost sacred. The third movement of "Come Spring! ", "Harmonic Fable," is very much in the hold of the early 20th Century classical music, and is wistful and majestic at the same time  not so different from Aaron Copeland. The next movement, "First Second Seder at the Knitting Factory," is sharply angled, often angry, and always harsh  completely different from what has come before, and yet still very much part of a larger whole. Brazelton's singing has always been possessed of an odd allure  no one will confuse her with Kathleen Battle or Ella Fitzgerald, but there is nonetheless something quite spellbinding about her singing. And the less structured the passage the better, so that "R" is the kind of dreamlike trance song one might hear at a witches' coven. The instrumentation is also different  matching alto saxophone and cello on "Called Out Ol' Texas," for instance. Or violin, guitar, bass and bongos on "R."
Brazelton has always preferred the road untraveled, and on "Chamber" she continues her intriguing musical journey.